We can wander the garden and see the last of the fall blooms. 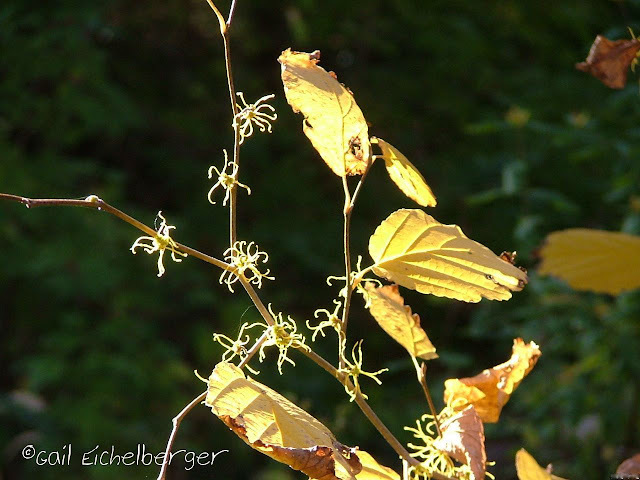 One of my favorites is a little witch hazel tree that never fails to bloom the first week of November. It lights up the shade and glows when in bloom. If we stand very close and the day is warm, we'll catch a slight sweet scent. That sweet scent attracts the small gnats, flies and bees that pollinate it. I've shared this before, but, just in case you're a new visitor~This garden wasn't a garden when we moved here. We live on land that was at one time a forest of hardwoods that was the source of building material for a growing Nashville. A woodland of secondary growth oaks, hickories and ash trees replaced the old growth forest. Many years later (mid-fifties) developers carved roads, built houses and created deep lots with expansive lawns. My yard has shallow soil and exposed limestone. It's not a cedar glade (too far from them to be one) but, it has some cedar glade characteristics that make gardening a challenge. It also had some very charming wildflowers in the woodland edges, declining redbuds, several lovely Ostry virginianas and absolutely no shrubs. It took me a few years to figure out and then plant the shrubs and small trees that would make sense (survive) on the shallow, clay soil that was wet all winter and dry most of the summer. Hamamelis virginiana was one of the first to be planted. It's a slow grower, but flowered that first autumn. I love them so much I added one more and then, a few years ago, I planted three Hamamelis vernalis in the Garden of Benign Neglect (back yard) and one in the front garden to honor my mother. 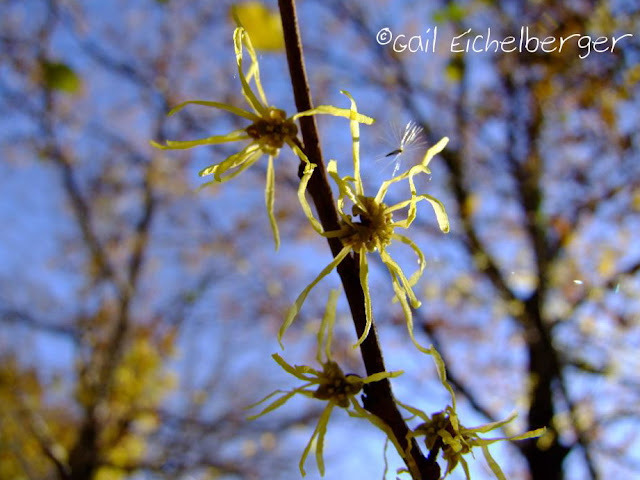 The Ozark witch hazels bloom in late winter for the earliest pollinators. The question I ask you gentle readers is this: "Can there ever be too many beautiful late fall or early blooming small trees/shrubs in a garden? I think not! There's always room for flowering plants that offer a sweet scent to the garden and food for pollinators. If you walk with me in the garden, I might wax poetically about witch hazels. Would you mind if I tell you how much I love them? I love the odd little flower that blooms every autumn. I love its spidery petals that curl open on warm days and curl up on cold ones. I love it's soft sweet scent. 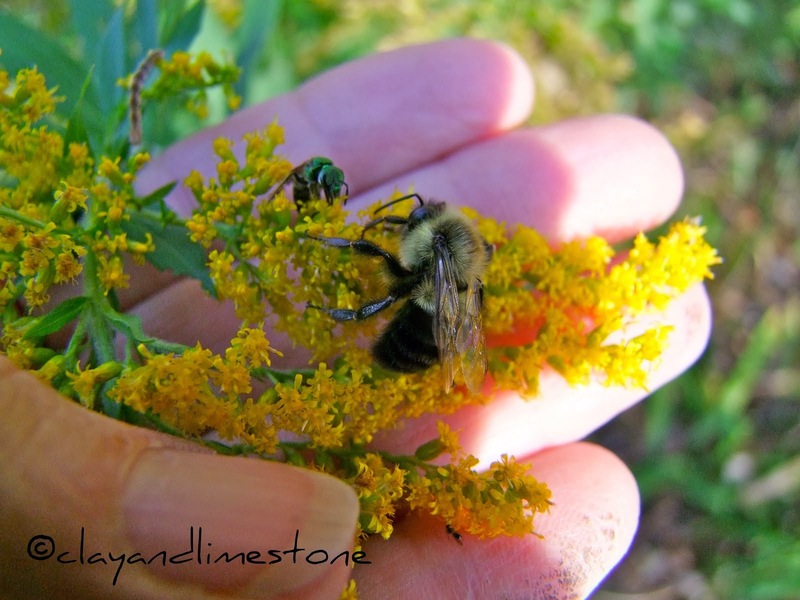 I love that it rewards pollinator visitors with sweet nectar and sticky pollen. I love that it blooms as the rest of the garden is going to seed and shutting down for the winter. I love the leaf shape and how it yellows up in autumn. I love that the fruit ripens into little capsules that pop open to expel the seeds in fall. I love that the branches were once used as divining rods to find underground water sources. I love that it's happy in my garden! If you take a walk with me we'll stop and admire the yellow blooms against November's beautiful blue sky, we'll look for pollinators and we'll get close enough to smell its fragrant flowers. I am sure you'll agree with me when I sigh and exclaim, "Nature is brilliant and amazing." It bears repeating...If you want to have pollinators in your garden and visiting your witch hazels and other fall blooming flowers you must never, ever, ever, ever, ever use pesticides. I mean never! It is a beautiful tree, Gail. The Witch Hazels are blooming here in Madison now, too. I don't have any, but the Arboretum has some. That reminds me--I need to get over there for a hike! Thanks for the inspiration! 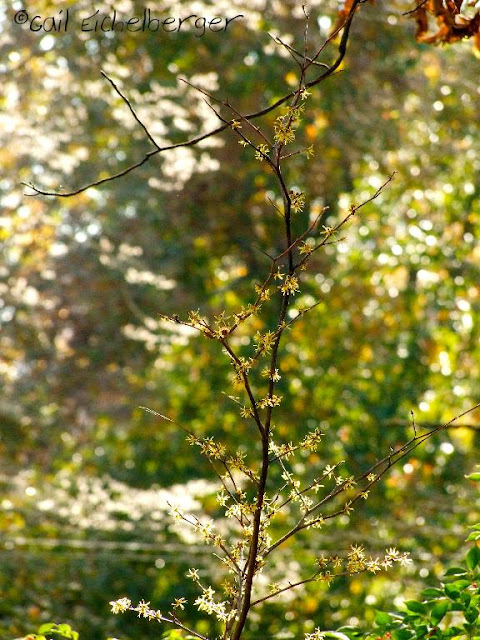 I love Witch Hazels, hoping that some of mine will bloom this year. Did you see the chrysalis one mine? (on FB) Love the clovey fragrance of these lovelies. those flowers are uniquely fun! My Witch Hazel isn't blooming yet, but it is a young tree. The leaves do have good color, though. Some day, I need room for a witch hazel. Do you know I've never even seen one in person? The fresh and spicy sent sounds like something I would just love! So thanks for letting me come and play! I have never smelled my Witch Hazels. Hmmmmm My sniffer isn't very good. I will have to try it to see if I can smell it up close. 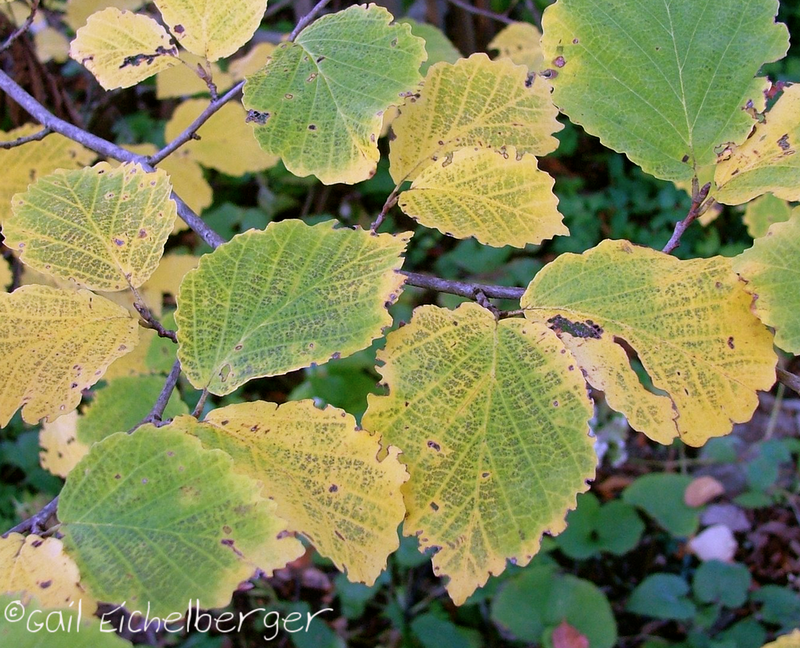 Our arboretum has some wonderful witch hazel specimens that I have been watching for several years, I am still looking forward to adding at least one to my garden. Well hello there Gail girl ! I don't know if you read my last novel, "The Age of Desire" but witch hazel played a big role in Edith Wharton's life. It was all in her diary...In her case, a scarlet witch hazel. I've always admired your witch hazels, Gail--such a welcome spot of color when all else is fading or gone. 1) Do your witch hazels need/prefer some shade? Thanks Aaron, It's a blogger widget that I used to be under add a gadget. Look for POWr or something like that. Gail - I haven't been visiting much these last months as we sold our country house and garden and moved to the 'city' and begain a new garden. We got quite a lot done on the new garden - all things considered - but there will be plenty of new planting to do in the spring. Witch hazel is definitely on my list. We are concentrating on native trees and shrubs - and if they are water tolerant so much the better. Our backyard soil is heavy clay and rainfalls just sit there for quite a long time. Your posts will be an especially big help to me. I have two witchhazels here, pallida and Jelena. They don't bloom here in North Wales until very early March. You are making me feel that I could easily fit in a few more! 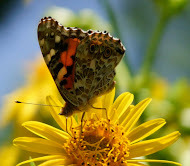 It is a treat to see the last of the blooms especially the natives and the pollinators and critters still about.